“Adventure Shopping” is the actual motto of one of my favorite stores. As someone who has been prone to careless, compulsive spending in the past, I have to watch carefully anything which links spending money to a sense of fun. And I do. But I still do need to buy things, and as long as I am going to buy the things I actually need, I like to make the experience enjoyable rather than tedious. One of my favorite stores ever was a nearby place called Kingston Liquidators. The store was run by a man who had earlier run an extensive closeout operation on Long Island called Sands Salvage. When he opened up in a large facility on Route 28 near the city of Kingston, he created a must-stop location for me. Not long afterwards he opened an even larger store just outside of Saugerties called Weekend Liquidators. When the owner of the Kingston Liquidators insisted on a large rent increase, the store shut down and all operations were transferred to Weekend Liquidators, which expanded its hours from two to five days but kept the name. The Liquidators stores were true salvage operations, offering merchandise picked up in bankruptcies, closeout sales and other such business disasters. The types of merchandise were fairly consistent, but you really never knew what you might find on a specific visit. However, there were almost always lots of packaged food items at extremely low prices. 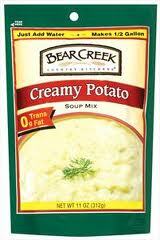 My favorite, which was frequently available, was a Bear Creek brand potato soup mix, really delicious stuff. I can still get a small package which makes about eight servings for $5 to $6, but the Liquidators sold large cans which made 48 servings for $8! At the time they were available, I was hosting a weekly pot luck gathering at my home—an event I really miss today. (We recently revived these meetings monthly.) Since I never knew in advance what people would be bringing, I sometimes needed to make something quickly and the Bear Creek mix became known as Emergency Soup. Over the years I bought clothing, appliances, and various household goods at the Liquidators stores, always at huge savings. Once I even found the DVD set of one of my favorite TV shows of all time, Mr. Bean. Eventually the owner of the store became ill and it closed. It was briefly revived in the town of Boiceville (under the original business name, Sands Salvage), out of my usual orbit but a place I visited occasionally. One of the store’s main attractions, low priced food, was no longer carried because it was near a grocery store and the lease prohibited it from carrying food. Now that store is also closed. 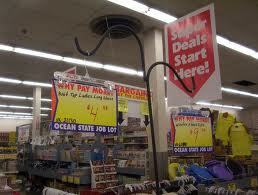 I’ve noticed that “job lot” chains tend to follow a regular pattern of flourishing and disintegrating. This occurred with the original Job Lot chain, which I remember from visits to New York in the 1970s. The stores start up with the same business model followed by the Liquidators stores, buying up surplus, damaged, or discarded merchandise. Eventually, though, their success leads them to expand to the point where they can no longer fill the stores with enough bargain merchandise, so they start creating their own, having things especially made for them to sell at low prices. This is the beginning of the end. As the quality of the merchandise deteriorates, business falls off and eventually they close. This might happen some day to the “Adventure Shopping” chain, Ocean State Job Lot (originating, as its name indicates, in Rhode Island). I first encountered these stores on Cape Cod, where I would go often to visit my parents at their summer home and now visit because the home has become mine. There are Ocean State Job Lot stores scattered around the Cape, including one in Hyannis which I used to visit frequently until I realized that it was messier than the others. These stores, originally selling closeouts strictly, have become hybrids, selling discount merchandise alongside of things that are just made to be sold cheaply, often for the chain. And it has continued to expand, to various locations around New England and now to a village (Valatie, New York) less than an hour from my home in Woodstock. But OSJL still has plenty of closeouts, from remaindered books to last season’s clothes to brand name pet supplies, and I still go there whenever I pass by. OSJL has lots of food, sometimes including the organic products I favor at surprisingly low prices. None of these stores will ever match in my affections such specialty shops from my past as the Discophile record shop on West 8th Street in Greenwich Village or the superb Wheat Fields food store in Woodstock. I wish I could have them back.